Travelling to different countries for business or personal reasons has become a norm with the easy availability and affordable cost of air travels. With this trend, Mobile Operators will see more mobile subscribers roaming into their network and their own subscribers roaming into other operator’s network as well. Mobile Operators should be looking at implementing Roamer Applications as an opportunity to increase revenue from this targeted group of roamers. Welcome SMS and Bon Voyage SMS (to be referred to collectively as Welcome SMS) are immediate Roamer Applications that Mobile Operators can launch. These messages enable Mobile Operators to communicate with roamers, which provide a channel to promote available services to increase potential usage and revenues. 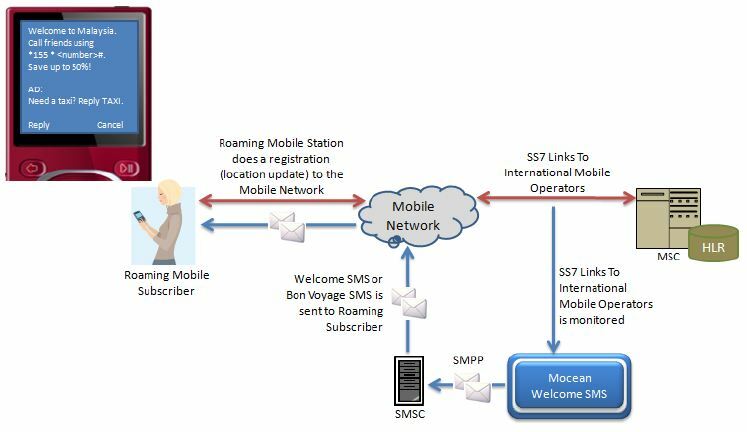 Welcome SMS solution is a non-intrusive system that monitors the SS7 links and checks for SS7 messages in the network indicating visiting roaming subscribers or outgoing roaming subscribers registering into the mobile network (usually as they turn on their mobile for the first time). Upon detection, Mocean Welcome SMS solution will then check for relevant messages in the message database to send to the subscriber. These welcome messages can be service usage guides, informational messages or promotional adverts. Advertisement Text Inserts with Mobile Advertisement capabilities can also be enabled within the system, providing additional revenue generation channel. Mocean Welcome SMS system provides Mobile Operator the complete messaging solution to communicate with roaming subscribers.